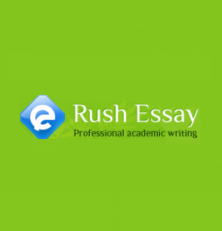 When we see a new company on essay writing services market, we always try to review them as soon as possible to provide you with detailed and fair information about their reliability. Qualitative academic writing services and satisfied clients as a result are our highest priority. Recently we stumbled upon the new website – rushessay.com. Check out the review! If you are a student, who is looking for a perfect combination of low price and high quality, you will be disappointed by rushessay.com pricing policy. The price of your future paper depends on your requirements: type of product being ordered, subject area, number of pages, level of quality etc. There are three quality levels: Standard, Advanced and Premium Levels. Standard Level provides you with a writer, who possesses a Master Degree, free bibliography, title page, outline and formatting. It offers 24$/page with 10-days deadline and 50$/page for a 3-hour deadline. Advanced quality Level provides you with all the same services + advanced plagiarism check and high priority of work. It supposes 25$/page with 10-days deadline and 52$/page with a 3-hour deadline. Premium Level of Quality gives you all the same features, as in Standard and Advanced levels, but beyond this you receive a writer with more than 5 years of experience and with a PhD in your sphere of studies. It offers 27$/page with a 10-days deadline and 56$/page with a 3-hour deadline. In addition, you have some additional paid services, like Urgent writer assign (84$), proofread by a professional (115$) and many more services at an enormous price. In our opinion, prices are really high – for 1 page of essay on web-design, standard quality, with 10-days deadline you are to pay 33$. The average price for page, regardless of subject, on the essay writing service market is 17$. This service is for students with a REALLY high income, otherwise you can not afford it. Every academic writing service has a customer support, which is designed specifically to resolve clients’ problems in the nearest possible time. Of course rushessay.com also represents this service. But its realization is terrible. It looks like an annoying pop-up advertisement, and when you click it, literally nothing happens. You can not start typing the text, and the chat window still continues to appear everywhere. On the top of the page we can see the toll-free number. Through the phone customer support is normally reachable. We waited on the line for 5-7 minutes and then received help from one of support agents. If you need help ordering the essay – better call them instead of using live chat (which is not really alive). One of the reasons why students search for paper writing services is their inability to clearly present or express their thoughts. That is why the crucial factor in selection of a company is quality. 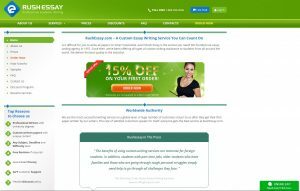 Students look for the best custom writing service for one simple reason – to be the most successful student in the group. If you want the same, better not refer to rushessay.com, because you will never receive any great mark for works written by them. As we previously mentioned, they offer you to choose one from three available levels of quality: Standard, Advanced and Premium. Well, when we were ordering standard quality work, we never thought, that in their understanding “standard” means “the worst”. We ordered a Term Paper on Agricultural Studies, Undergraduate level, with a 7-days deadline, 15 pages, APA formatting. The total price for our order was 441$, which is a very big amount for such a work. We just took a deep breath and placed our order. It was shocking that they were searching for a writer to start our Term Paper for 24 hours, and the deadline countdown started calculating after the found him! So, basically, we received our order a day later. Also, the writer designed our work in an MLA format instead of APA, misunderstood the topic and, as a result, gave us a horrible work, which was not suitable for representation in a university. We called a company once again to rewrite the work or to give our money back. The support agent answered and provided us with writers’ personal e-mail and phone to contact with him. As you may guess, the writer never answered neither on e-mail nor on call. “Great” service, “Great” quality, yeah. Although, their website has a user-friendly design. It is easy to find any information you need. The customer support live chat window looks like an annoying pop-up advertisement, but everything else is totally fine. You have all main buttons (About Us, Services, Prices, Discounts, Order Now) on the top and on the left of the webpage, so you can be sure, that you will always find anything you want. To be short – we don’t recommend this website to order essays online. Huge prices and absence of cooperation with your writer will do you no good.